Designed for 1955-86 262-400ci Chevy V8s with spread-bore carburetors. Delivers maximum power with a broad torque curve for high-performance street. Carb pad will accept square-bore carbs without adapters. Has provisions to add oil fill tube. No provisions for exhaust heated or stock-style choke. Accepts late-model waterneck, air-conditioning, alternator and H.E.I. Will fit cast iron Bowtie heads, but will not fit 1987 and later cast iron heads. Will not fit under stock Corvette hood. Carb Pad Height: 4.72" Click here to determine carburetor pad height. Recommended intake gasket, Jegs p/n 555-210001. Q-Jet applications require automatic divorced choke rod p/n 350-9172. Use Edelbrock carburetor-to-manifold bolt kit p/n 350-1925. 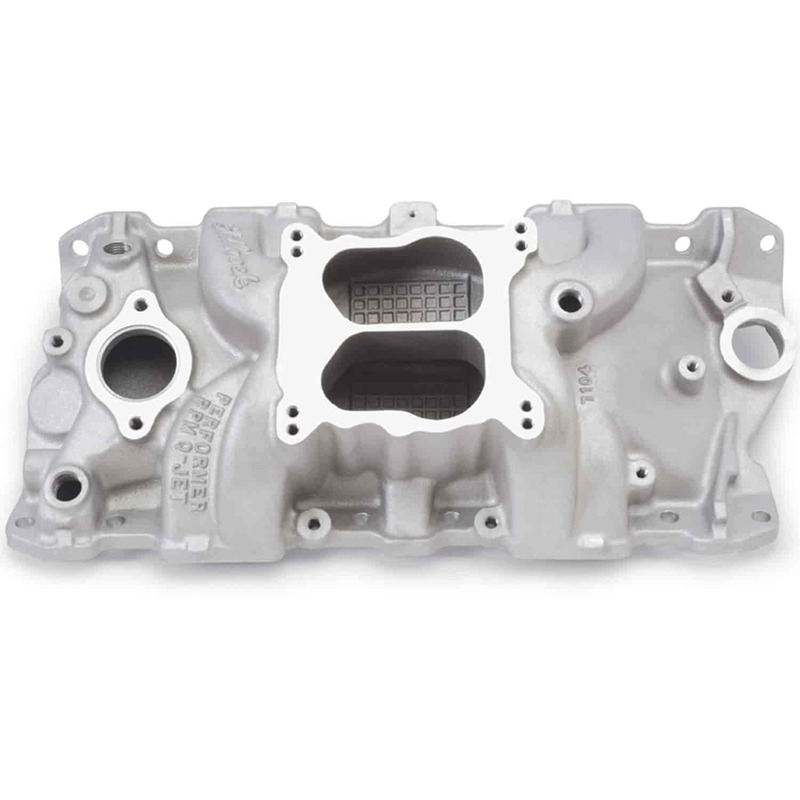 For ultimate street performance, bolt on an Edelbrock Performer RPM Intake Manifold. A dual plane, high-rise design makes incredible power to 6500 RPM with streetable torque for great throttle response. Larger plenums and runners match the free-flowing exhaust, high-lift camshafts, and other modifications of high-output engines (especially Performer RPM Cams and Cylinder Heads that optimize performance). These intakes are not for emissions-equipped engines. 7104 is rated 5.0 out of 5 by 1.